Friday 13 March – Doors open 7.00 for 7.30 start. Approx 10.00 pm finish. Bar open from 7.00 pm. Cost per person £5.00. 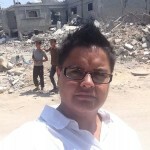 Kerry-anne, an Independent Journalist and writer, has been visiting Palestine and Israel since she was a young student in 2002. At that time she committed not to forget the Palestinians. She made her most recent visit in August 2014, to Gaza, and Israel, at the height of Operation Protective Edge, in order to make a film that would show the side of the story that our main stream media does not acknowledge. Palestine: What Hope Peace? is the result. Kerry-anne is showing this film up and down the Country and there will be a Question and Answer session from her after the screening. Don’t miss the opportunity to expand your horizons and to meet this dedicated, articulate, inspiring and brave woman who will undoubtedly make an impression on you. The film offers a rare and valuable insight into what is really happening in Palestine and brings stories from the heart of the matter. 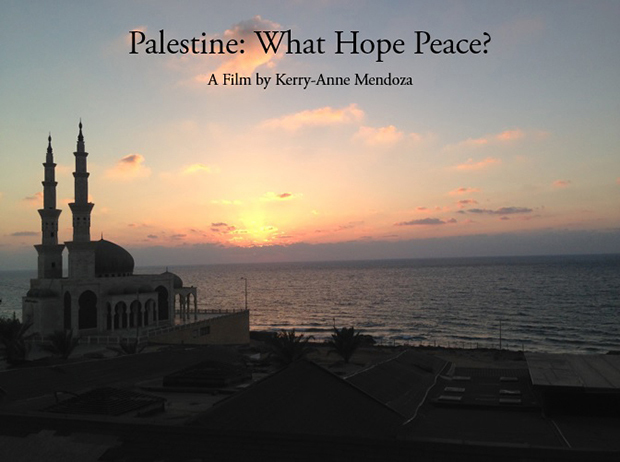 It features eye opening and heart breaking first hand testimonies from Israelis and Palestinians working against the odds for a just peace in the Middle East as well as archive footage and Kerry-anne’s own eyewitness experience, some of which will be heartening and inspiring and some of which will be hard to witness. The film also provides some startling historical background – some of which will be from a perspective new to even the most well informed. Also included are several testimonies from the Russell Tribunal. The people’s tribunal which exists to make public, and a matter of record, situations where international law is violated but is not being dealt with by international jurisdiction, or that are recognised but continue with impunity due to lack of political will on the part of the international community. Those who care about humanitarian issues in general and those who wish to enquire further into the Palestinian/Israeli situation from whatever point of view. Essential for anyone with an involvement in any kind of political activity. A new perspective which will undoubtedly add to what you already know and might cause some major re-thinking of your point of view. You will be inspired, moved, and amazed and maybe even a little angry and horrified. An open mind and a willingness to be inspired, moved, and informed. Kerry-anne lives in Bristol and works as an Independent Journalist. She is the author of Scriptonite Daily, a thoroughly researched Blog covering a wide range of social and political issues. She is the author of a book recently published by New Internationalist: Austerity – The Demolition of the Welfare State and the Rise of the Zombie Economy.